I’ve been working as a trainer for 25 years now. Back when I first started, I learned quickly that strength was, and is the most important quality we can cultivate. Strength training using evidence based exercise concepts is the safest, and most efficient method to impact global health and fitness in minimal time. As I have said before, strength is the foundation of function. As a strength coach and personal trainer, the question of training for balance often comes up. Athletes often want to know if there is an exercise that they can do that will improve their balance in their chosen sport. For average fitness folks the balance question most often arises as it relates to aging and maintaining mobility. Many coaches and trainers on the “Balance Training” Band-Wagon claim that functional exercises should be performed on an unstable surface, in order to promote balance. This is a very common approach to training equilibrium, whereby the emphasis is placed on proprioceptive sensitivity and core stability. While it seems, superficially, to be an obvious method of choice, it is actually counterproductive to real functional stability. The irony in these methods is that the property that is introduced to try to enhance balance control — an unstable surface — is the very element that prevents the nervous system from correcting for postural deviations. Equilibrium is maintained through the application of force into the ground. As the center of gravity shifts over the base of support, force is applied through the feet in order to re-center the center of gravity. 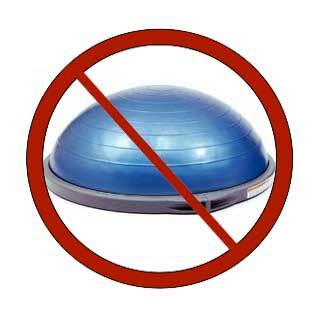 The inherent problem with labile surfaces (wobble boards, dyna-discs etc) is that the objective of the exercise is to avoid displacing the surface. In other words, the goal is to keep the surface from moving. To do this, the subject must actually resist applying force to the surface, and therefore, is being trained not to exert force which is the exact opposite of what you are trying to accomplish. Clearly this practice would have a dubious effect on balance control. Furthermore, this type of balance training involves static balance control, in which motion of the center of gravity is severely restricted. Hamilton and colleagues (2008), quite interestingly, report no correlation between static balance control and hopping capability, a very dynamic stability problem, and one of those “highly functional” movement skills. What does seem to aid in balance control is increased muscular strength and power. Research demonstrates evidence of a direct correlation between muscular strength and power, and the ability to maintain balance (Orr, et al, 2006, Santos and Liu, 2008). Butler and associates (2008) have even determined that insufficient strength in the ankle musculature results in a reduction of proprioceptive acuity. Conversely, increased muscle force capacity contributes to enhanced proprioceptive capability. Arguably, equilibrium may be enhanced through a simple process of muscle strength development that promotes force application. This may, in fact, be accomplished on a leg press. The truth is that balance is task specific. A common misconception is that fundamental abilities can be trained through various drills or other activities. The thinking is that, with some stronger ability, the athlete will see gains in performance for tasks with this underlying ability. For example, coaches often use various balancing drills to increase general balancing ability. Such attempts to train fundamental abilities may sound fine, but usually they simply do not work. Time, and often money, would be better spent practicing the eventual goal skills. There are two correct ways to think of these principles. First, there is no general ability to balance, rather, balance is based on many diverse abilities, so there is no single balance ability, for example, that can be trained. Second, even if there were such general abilities, these are, by definition, genetic and not subject to modification through practice. Therefore, attempts to modify ability with a nonspecific drill are ineffective. A learner may acquire additional skill at the drill (which is, after all, a skill itself), but this learning does not transfer to the main skill of interest. Do not attempt to mimic or imitate a skill by using a completely separate *gadget, or with exercises in the weight room. It can’t be done. Strengthen the muscles in the weight room, develop a high level of conditioning, and practice the skills used to play your sport or game. It’s that simple! *In Plain English: (Just in case I have not been 100% clear up to this point). You should never waste any time or energy doing any of the things demonstrated in the images above if your goal is to improve performance in a totally separate sport or activity. Bryant, C.X. 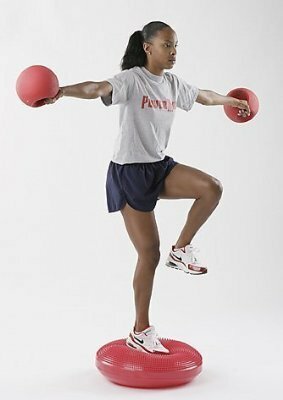 (2008) What is functional strength training? Butler, A.A., Lord, S.R., Rogers, M.W., and Fitzpatrick, R.C. (2008). Muscle weakness impairs the proprioceptive control of human standing. Greenfield, B. (2005). Functional exercise that makes sense. Hamilton, R.T., Shultz, S.J., Schmitz, R.J.